2Sync Review 2019: Is 2Sync a Good Hosting? 2Sync is a premium web hosting provider that offers dedicated and virtual private servers based in multiple locations around the world. They don’t offer shared hosting at this time. Founded in 2014, 2Sync is an Indian website hosting provider specializing in VPS and dedicated server solutions. The data centers they use are housed in the following countries: India, South Korea, Japan, Taiwan, Hong Kong, Panama, Lithuania, Poland, Serbia, Turkey, Ukraine, Israel, and Saudi Arabia. Though they’re new to the hosting scene, they now have over 2000 clients worldwide with over 500 servers deployed. Their offering is truly global and their website is provided in 104 languages, from English to Zulu. 2Sync focuses on providing VPS hosting, dedicated servers, and domain registration services. Their servers are located in many different countries worldwide, so customers can pick the most suitable option for their needs. They don’t currently provide shared hosting. The most obvious benefit of 2Sync is their colossal worldwide provision. Not only do they provide servers in numerous locations, but their website is translated into every language imaginable. What also impressed me was their dedication to providing servers in locations that may be missed by bigger players. Unfortunately, after more research, it soon became clearer not every location listed on their website had available stock. Another slight downside of 2Sync is that they’re not currently selling shared hosting. For many users who simply want a basic website, shared hosting is more than sufficient. However, this may be a service that 2Sync will reintroduce in the future, as their website notes that they have only temporarily stopped shared hosting. By far the biggest disappointment, however, is that 2Sync doesn’t offer any uptime guarantees or SLAs on their enterprise-grade hosting solutions. Considering that they’re marketing themselves as a premium web hosting provider, this is surprising — and likely attributable to the fact that none of the data centers they offer their solutions from are wholly owned and operated by them. On the upside, getting set up is easy and can be done entirely through their website. Furthermore, their admin interface is easy to use and allows you to adjust your plan easily. 2Sync’s prices are high when compared to other Indian providers and also larger international brands. However, they do offer flexible payment terms, which is definitely advantageous. For the most part, 2Sync doesn’t offer any discounts for longer contracts: the monthly price is the same whether you’re signing up for a month or a year. You can select from monthly, quarterly, semi-annual, or annual billing periods. They don’t offer a free trial or free plan, but this is to be expected of VPS and dedicated server hosting. 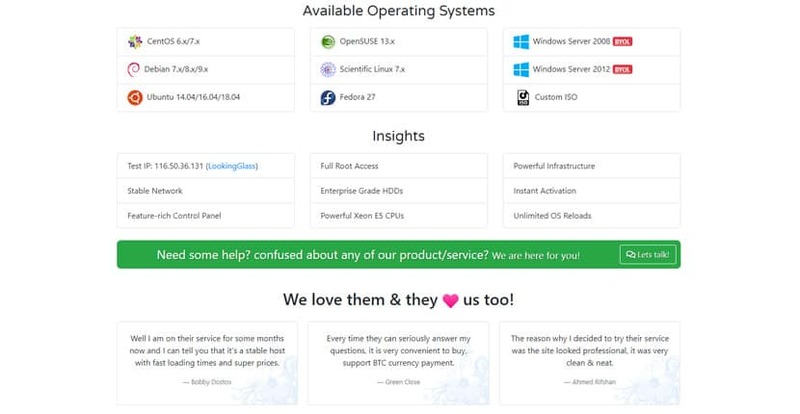 I was initially excited when I saw their customer support options as they offer several ways to get in touch. You can reach them via Skype, email, phone, Telegram, and live chat. However, after sending them a message on Skype, I didn’t get a response. The same was true of their live chat even when they indicated they were online, which was very disappointing. They don’t clearly advertise the timings their support is available, which is a bit off-putting in the event that I have any issues with my hosting. What’s more, their FAQ section was empty, so I couldn’t find any answers on their website without their assistance. 2Sync seems to want to position themselves as a user-friendly platform that connects would-be webmasters to VPS and dedicated server solutions, but their lack of service guarantees and inconsistent support leave much to be desired. They’re also not a beginner-friendly option, so those who simply want a basic website will have to look elsewhere. Wondering how 2Sync stacks up against other Web Hosting companies? Enter any other Web Hosting company and we will give you a side-by-side comparison.